Reflexology is a very relaxing therapy that works on the various parts of the body through the feet, hands and ears. Essential oils can also contribute to this relaxation by adding another dimension to the session. They can be used in various ways. Using an aroma diffuser or oil burner is one of the easiest ways to introduce essential oils into the reflexology treatment. Choose an oil that the person likes from the following list, all are relaxing. Place 3 or 4 drops into the diffuser or oil burner. Geranium, lavender, mandarin, neroli, palmarosa, petitgrain, sandalwood. You may also choose to diffuse one or two of the antibacterial oils during the cold and flu season. While you are taking a client’s history or as a prelude to the treatment you may like to use essential oils in the footbath. Antibacterial or antifungal oils can be used if you wish. Note that if you don’t use a solubiliser, use full fat milk or bubble bath to mix the oils in before adding to the bath or else the essential oils will sit on top of the water. 2 or 3 drops of essential oil is enough for a footbath. 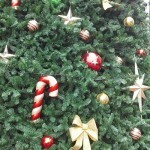 Antibacterial oils include eucalyptus, frankincense, lemon, niaouli, pine, tea tree. Antifungal oils include, geranium, lavender, lemon, marjoram, myrrh, teatree. You can make your own cream or lotion to use on the feet during the session if you wish. To 10 grams of aqueous cream or lotion add up to 4 drops of your chosen oil or blend and mix in well. A mini mixer used for mixing drinks works well. 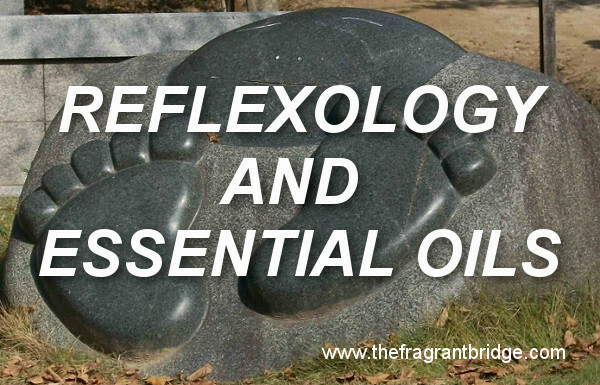 You may also choose to add a drop of essential oil to the reflex area being worked. 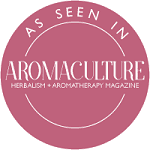 Roman chamomile in 3% jojoba works well to calm the solar plexus or for digestive problems. 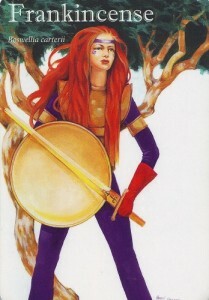 Rose in 3% jojoba in the heart area can be used for grief or emotional issues. A drop of basil mixed with a drop or two of cold pressed vegetable oil can be applied to the toes to stimulate the brain or aid concentration. You may wish to massage the client’s feet and legs as a way to finish. 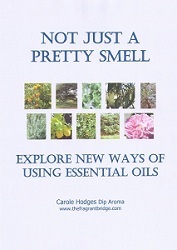 Again essential oils used in a cream or cold pressed oil can be a wonderful way to do this. In this case you may choose to use some stimulating oils to send them on their way. To make a blend use a total of 4 to 5 drops of essential oil in 10mls of cold pressed vegetable oil. Stimulating oils include basil, jasmine, peppermint, rosemary. This entry was posted in Essential Oils and tagged aromatherapy, essential oils, footbaths, reflexology on December 9, 2015 by Carole Hodges. 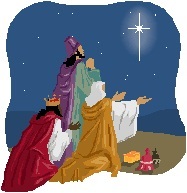 they presented unto him gifts; gold and frankincense and myrrh. Frankincense is an oil that is often associated with Christmas as she is one of the gifts given by the three Magi to the baby Jesus. She also has had a long tradition of being used in religious ceremonies. 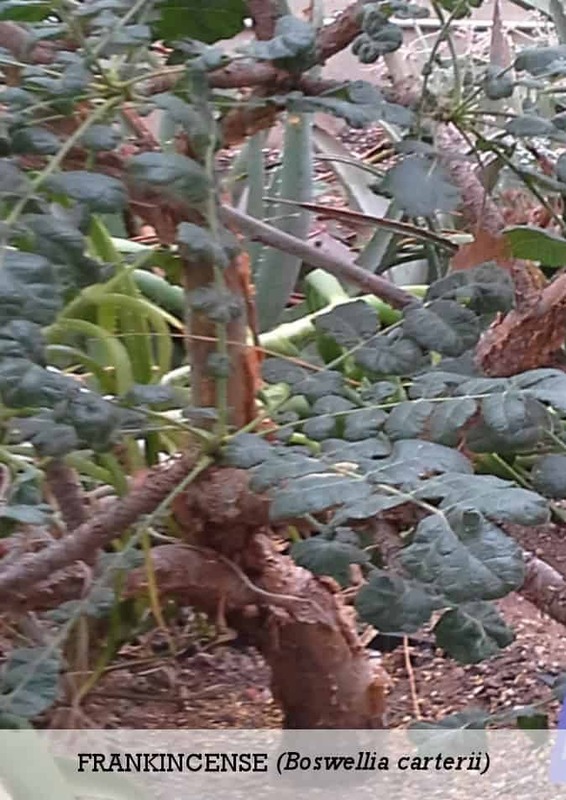 Plant: Frankincense is a small tree that grows to a height of 7 metres. It has abundant narrow leaves and white or pale pink flowers. 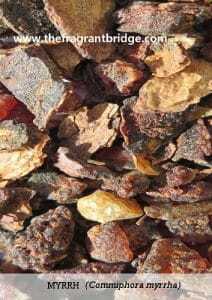 Interesting snippets: Frankincense has been burnt in temples and used in religious ceremonies for centuries and continues to be used even today for that purpose. 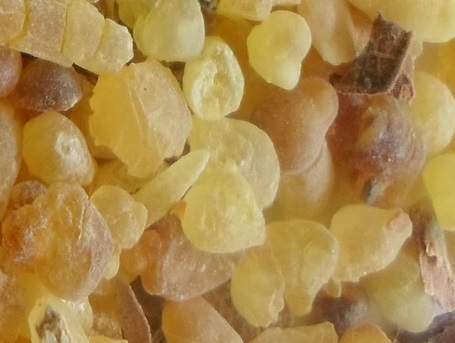 The Egyptians believed Frankincense was the sweat of the Gods, which had fallen to earth. The earliest recorded use of Frankincense was found in an inscription on the tomb of Hatshepsut, a 15th century BC Egyptian queen. Kohl, the eyeliner used in ancient Egypt was a powder made from ground charred Frankincense resin. 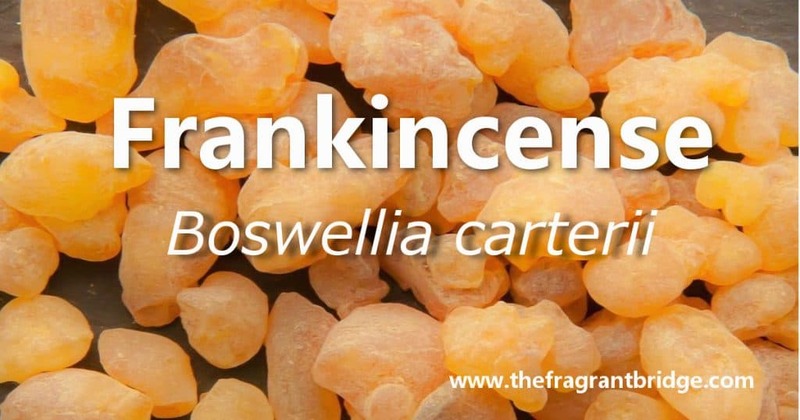 The name Frankincense is derived from the Old French franc meaning free, pure or abundant, and the Latin incensum meaning to kindle or to smoke. 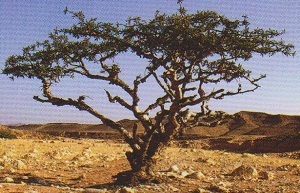 It is theorised that the “burning bush” in the bible was a Frankincense tree whose evaporating essential oil ignited. Part of Plant used / Extraction: Resin. The resin is usually harvested in spring and autumn. The bark is usually scraped or chipped away to expose a milky white resin, which is allowed to dry in the sun for 2 weeks or more. During this time the resin forms yellowish tears, which are scraped off and collected in baskets and then shipped to France to be steam distilled. The tears contain 56% resin, 30% gum and 4-8% essential oil. Therapeutic actions: Very good for respiratory conditions including bronchitis, laryngitis, coughs and congestion. Skin care for mature, dry and sensitive skin. Excellent for wound healing. Emotional and Spiritual: Slows down breathing and induces feelings of calm. 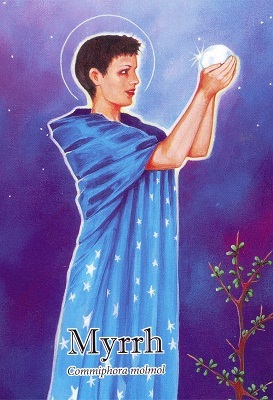 Ideal for meditation as she helps to still the mind and cease mental chatter allowing the spirit to soar. 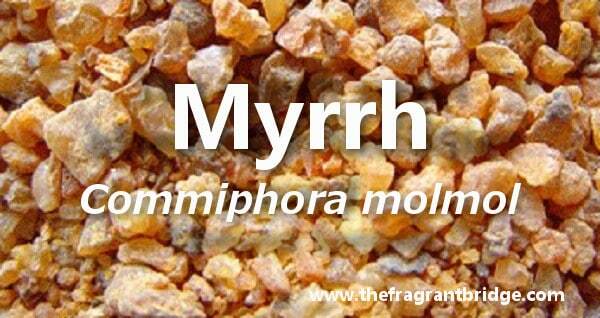 Helps restore a sense of equilibrium when feeling anxious or confused. 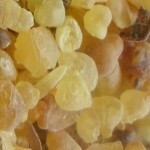 Gabriel Mojay writes that whenever you have allowed yourself to be weighed down by the past, or any form of over attachment frankincense can help you break free by encouraging tranquillity, insight and spiritual self discipline allowing the ego Self and transpersonal Self to work in unison. 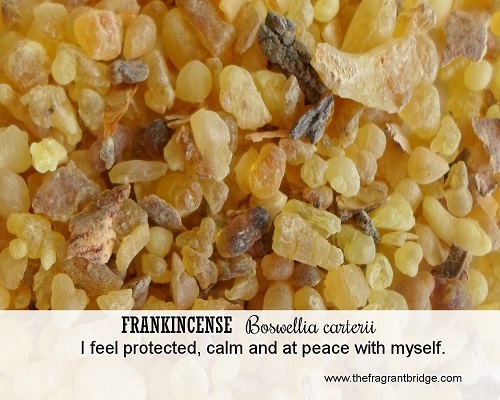 Robbi Zeck writes that Frankincense cleanses the aura, is finely attuned to the subtle energies and paves the way to the higher self. It will cultivate positive inner guidance so that your true self can be seen. 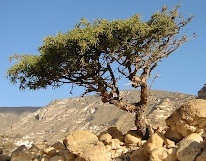 Valerie Ann Worwood writes that in cases of spiritual shock or loss, when the spirit can step out of the body, even for a brief moment, Frankincense can gently ease us back into our earthly home. The oil for protecting your space and you from worry overwhelm and anything or anyone that drains your energy. 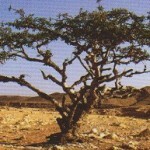 Frankincense links your past with your future, which relates to how you perceive and handle the present. You can be the wise person that you are by protecting yourself from life’s negative experiences. Feel protected and free. 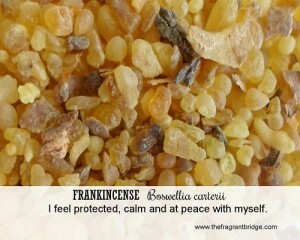 Fragrant Change: I feel protected, calm and at peace with myself. Are you obsessing over something that happened in the past? Are you worried about the future and something that may never happen? Have you lost touch with your spiritual self? 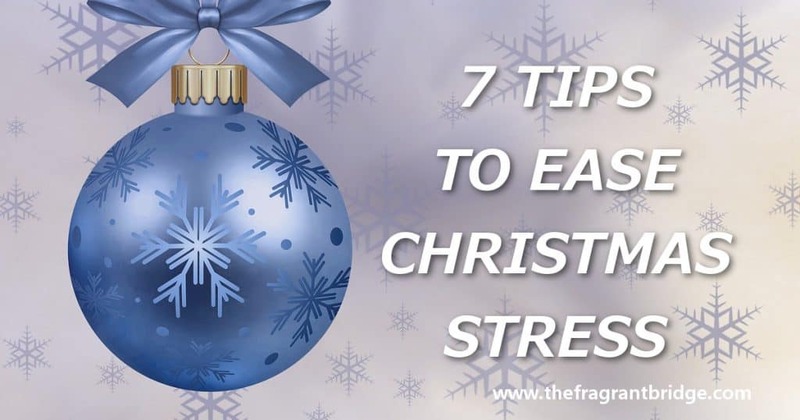 Are you feeling overwhelmed, worried, stressed or anxious and need to put things in perspective? Are you procrastinating because the outcome is uncertain? Time to get clear and still your mind so that your inner guidance can be heard. Sit quietly, slow your breathing and concentrate on something that brings you a sense of peace. Slow your breathing even more. Allow your inner guidance the chance to give you an answer. 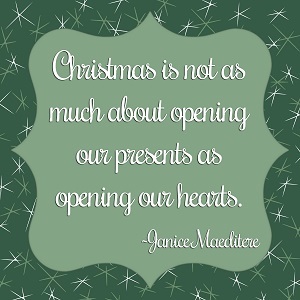 This entry was posted in Essential Oils and tagged frankincense, meditation, protection, respiratory conditions on December 2, 2015 by Carole Hodges.